London Quiz: Where Is This? Haven’t the faintest, but it would certainly make a fantastic 1,000 piece jigsaw puzzle. Wait, do they sell the Saturn car in the G.B.? It would be great in the showroom entrance. There doesn’t appear to be enough space for the word ‘great’ but it’s definitely something land street. I remember that rain installation you showed us, Chris, and there was another one somewhat similar – is that the connection (ah, we’re back at connections, is this an ongoing theme?) I thought that a ‘sun’ installation would make more sense in London. We’ve had less than half the normal sun since the beginning of December but the sun is out today. Hooray! It must be Gt Portland Street. It’s like one of those designs to test if you are colour blind and it would be nice if it only showed up when it rained – something to look forward to when the sun wasn’t out. 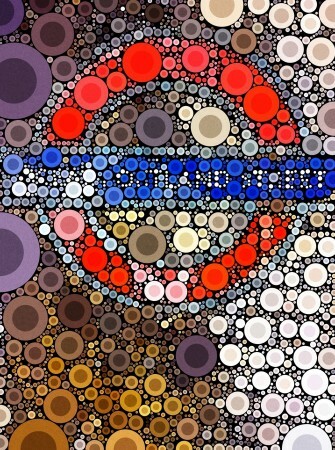 I can see a London Underground motif but i’ll be damned if I can see anything even resembling Great Portland Street. Help, whats happening to me. This is a stumper. The clue “rain” doesn’t help. Admin seems to use that “clue” once or twice per London, nay British, piece. So, the quite attractive thing could be just about any place. I for one throw in the towel: And the answer is…? It is indeed Great Portland Street (the shot treated by an app on my mobile), and as far as I know it is the only central London tube station where it regularly rains inside. Most of the platform is covered, but for some reason the rain hammers through this one and onto the brickwork, creating stalactites and leaving the tube signs picturesquely stained with drizzling rainwater. 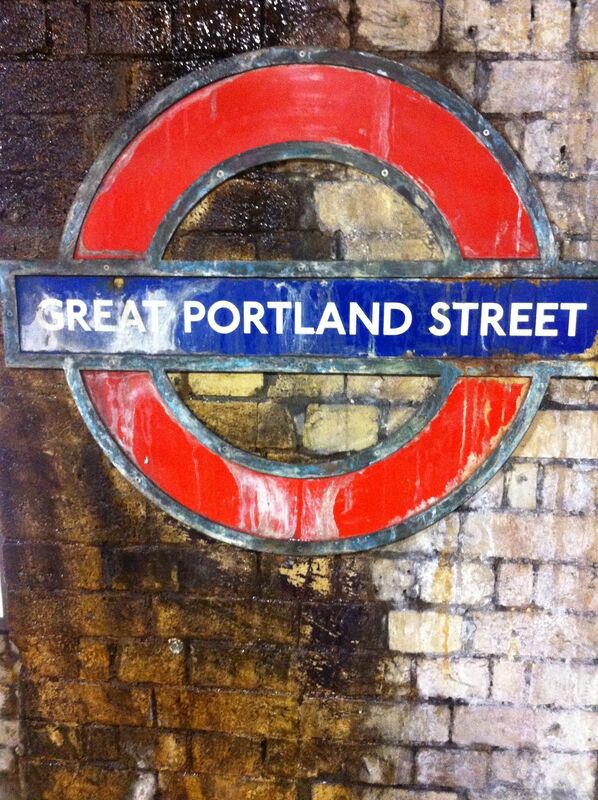 Remind me not to use the Great Portland St. station. Rain is bad enough when it stays outside where it belongs, but am not accepting it indoors. Stalactites indeed! That’s a neat app but it’s a bit of a cheat. U’m a tributary to the River Fleet i’ve always thought because if u stand on the west bound platform of the station the water is pretty much at its worst on the north east of the E bound platform. And theres the puzzle of the Nannys tunnel if u think about the site of Great Portland street and you have a look round there you come across a tunnel which you cannot access but can be access by families who live in the garden square to the south of Euston road this connects up with Regents park i think (if i remember it correctly) and is known as the Nannys tunnel where nannys could x the road without endangering their charges by exposing them to traffic – a big deal about a century ago when London adapting to the motor vehicle. In reality this should have been pedestrian access for Euston road N side to get to Great Portland street station but i wold guess that damp and potential flooding was the reason it did not open. I’ve been in the tunnel and its classing London underground construction but not tile lined. Someone told me today that there is talk of opening the closed stations on the tube as some sort of tourist thing, but that’s not really possible, is it? Didn’t someone here say that there’s a house built over top of one of the stations? H u are getting a bit confused with two fake houses in Bayswater which conceal vent points which eliminated steam and dirt from the tube lines when the tubes were steam trains. You can access a lot of the empty tubes i ‘ve got into a few (but then i am a real saddo) and they r very interesting. Incidentially i was getting a bit confused re the above the nannys tunnel is probably closer to Regents park tube bakerloo than Gt Portland st mind u they r very close and i bet thats to do with water infiltration at time of build! !